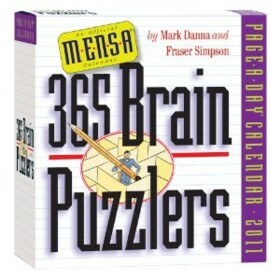 Mensa 365 Brain Puzzlers Calendar is a book in the Other genre written by Mark Danna and Fraser Simpson. The book was published by Workman Publishing Company on 2010-06-15 and contains 320 pages. The book has an ISBN number of 978-0761156741. Our users found the overall impression of this book to be Educational. I purchased the 2011 edition of the Mensa Brain Puzzlers Calendar around Christmas and am currently about half way through the 365 daily puzzles. It's great that every day presents a new challenging puzzle. The puzzles provided span a wide range of categories such as word puzzles where you have to do things such as unscramble words and fill in the blanks, as well as standard logic and trivia puzzles. For the most part, I have been happy with the puzzle selection and with the difficulty of the puzzles. However, I feel that some of the puzzles have been designed assuming the reader has too much base knowledge - especially the word puzzles. In some cases, I had no idea what some of the words meant so I would hardly call those words "common". Also, the reader should have a good understanding of math as well as basic logic skills otherwise they could become frustrated during some of the harder puzzles. Luckily, the solution to each of the puzzles is provided on the back side of the page for each puzzle - so you can easily take a "sneak peek" if you encounter any difficulties :). Overall, I found the Mensa Brain Puzzlers Calendar extremely enjoyable and will likely purchase next years edition as well. It's great to have something that's "more" than just a standard boring everyday calendar. I actually find myself looking forward to what kind of puzzle the calendar has in store each day. I highly recommend this calendar to anyone that enjoy brain teasers.